Stop Deer Eating Your Marijuana Plants Now! When you planted your marijuana garden, you probably didn’t account for the local deer population. It is something you’re going to need to think about; however, as they are vegetarian animals that love to eat plants. If your plants are out in the open, it’s unlikely that deer will ever make it to your garden – and if they do, you will most likely see them. If, however, your plants are located somewhere with dense tree cover, you may encounter a deer problem. Deer are nocturnal and are therefore most likely to come to your garden in the middle of the night when fewer humans are walking around. If they do stumble upon your marijuana plants, they will have a heyday, devouring your precious plants’ leaves buds, and entire seedlings. Really the only way to handle a deer problem is to use any means necessary to keep them away to begin with. If they do discover your garden and get the chance to eat to their hearts’ content, they will cause some serious damage to your plants. First, you can try adding a fence around your garden. This should only be done in locations where growing is legal, however since it is extremely obvious then that someone is growing marijuana. The fence itself should be eight feet high at a minimum, and should be constructed out of durable, sturdy materials. Deer generally don’t jump higher than six feet, but occasionally jump as high as eight feet if they panic. Ensure there is no room between the slats for deer to slide through or crawl underneath in order to access your garden. They are more nimble than you might think. A second fencing option is to use an electric fence. Some people “train” the wild deer in the area by putting peanut butter on the wire or on a foil tag that is attached to the electric part. When the electric current is turned on, the deer will experience quite the shock when he tries to eat the treat. One or two of these shocks will remind him not to try again, after which your crop is likely safe. You can also take advantage of the fact that deer are easily spooked. Someone approaching or the sudden appearance of bright light are two ways to scare a deer. Some growers, therefore, equip their gardens with motion sensor lights, placed in specific spots. Make sure you are carefully placing these and pointing them away from your plants (but low enough to scare the deer away); otherwise it could disrupt the timing of your plants’ natural life cycle. You also can use something referred to as a “scarecrow sprinkler,” which blasts an intruder with sudden, high-pressured water. A scarecrow sprinkler is available for $65 at this link here. If you don’t have the time, money, or energy to utilize one of these techniques, there are some other options available that are inexpensive or completely free. 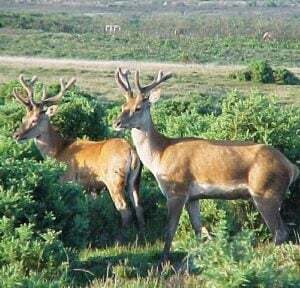 Repellents with specific scents can be quite effective, due to the strong sense of smell that deer have. For instance, they hate the smell of human hair. You can, therefore, take hairs from your hairbrush and sprinkle them all over your garden and on top of your plants. Human urine is also offensive to deer; pee in a jar and bring it along with you next time you go to tend your crops. Other predators’ urine also works. You can buy coyote, fox, or bobcat urine online, and then follow the directions for how to apply it. This (both human and other predator urine) will need to be done again every time it rains. They hate the smell of rotten eggs as well, so try mixing 2 parts egg and 8 parts water, then drench your plants with it. Otherwise, you can deter them like you would a vampire – take crushed garlic, put it in nylon socks, and hang it on the trees around your garden. Scented bar soap is also an option – just drill a hole in it, add in some fishing line, and tie it up next to your plants. Dial and Lifebuoy soap work particularly well. Fabric softener sheets hung from trees is also effective, as are moth balls put in a nylon stocking and hung up. Don’t forget: deer can get used to whatever smell you’re currently using, to switch it up every so often to keep them away. The best way is to combine it with motion lights or sprinklers, just to make sure. Your plants are at the greatest risk before they have matured. This is simply because the cannabinoid levels of your plants increase as they get older. 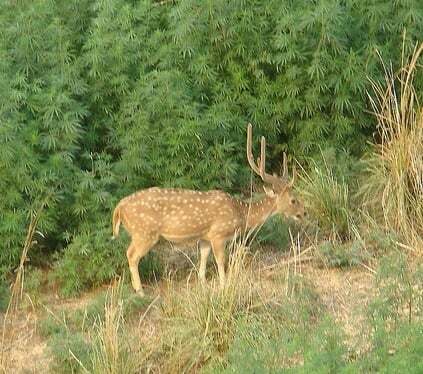 Almost all herbivores (except deer) therefore dislike the taste of marijuana plants; deer like it just fine until the plants have reached their peak levels of cannabinoid, making the taste unpleasant to even the deer. You therefore simply need to keep your plants until the point when they have reached maturity – then you can rest easy knowing that the deer are no longer a threat. Remember that plants with strong genetics have less change of getting sick and are less vulnerable for pests and diseases. So make sure to buy marijuana seeds from a trusted seed bank.